The Associated Press fact checked the first Indiana U.S. Senate debate Monday evening among Democratic incumbent Joe Donnelly and his challengers Republican Mike Braun and Libertarian Lucy Brenton. 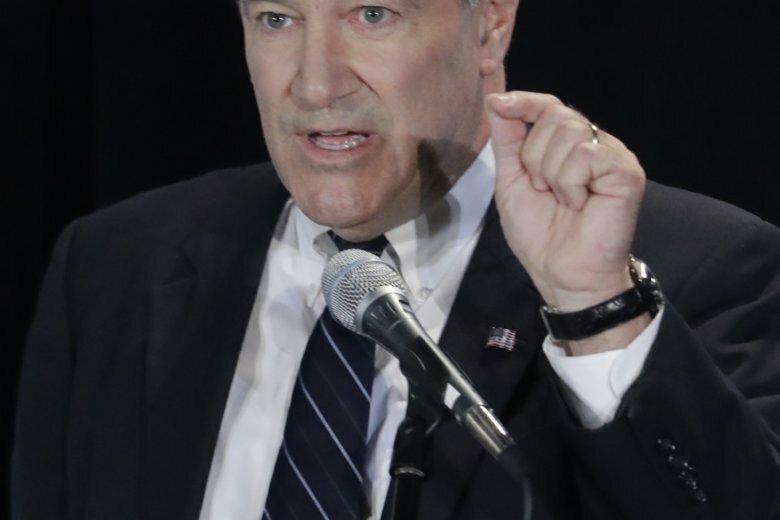 Donnelly, a moderate Democrat who has been in Congress since 2006, is considered one of the country’s most vulnerable incumbents in his race against Braun, a Republican who’s modeled his campaign as a political outsider and businessman after President Donald Trump. THE FACTS: Braun has suggested otherwise. He has previously called for Congress to scrap the entire Affordable Care Act, which would wipe away protections that prohibit insurers from denying coverage or charging more in premiums to people with pre-existing conditions. An estimated 1.1 million people under the age of 65, in Indiana have a pre-existing condition, according to a 2015 report from the nonpartisan Kaiser Family Foundation . Last year, while Congress considered a repeal of the Affordable Care Act, Braun authored a newspaper article urging Congress to force a full repeal of the health care law. In that letter, he vowed to “take action and keep pushing for the full repeal of Obamacare” if elected to the U.S. Senate. As recently as June, Braun said on Twitter that he would work with Trump “to fully repeal and replace Obamacare with free-market solutions .” In August, Braun told Politico he supported a lawsuit filed by a group of Republican attorneys general that seeks to have the health law declared unconstitutional. THE FACTS: Donnelly’s public explanation for casting a vote against Supreme Court Justice Brett Kavanaugh has shifted since he first announced late last month that he would oppose Trump’s judicial nominee. “We have been unable to get all the information necessary regarding this nomination, despite my best efforts,” Donnelly said in the statement. At the time, Donnelly did not cite the judge’s temperament as a reason to oppose Kavanaugh, who had raised his voice and accused Democrats of a “political hit” while defending himself before the Senate Judiciary Committee. No sooner had Donnelly issued his statement on Sept. 28, than U.S. Sen. Jeff Flake of Arizona called for the FBI to conduct a weeklong investigation into the claims. Fellow Republicans relented, and the investigation was conducted by the FBI, rendering Donnelly’s original stated reason for deciding to vote against Kavanaugh moot. Asked during Monday’s debate about the controversy surrounding the Supreme Court nomination, Donnelly made no mention of the sexual assault claims against Kavanaugh or the FBI investigation as a reason for his ‘no’ vote. THE FACTS: Braun owns a national auto parts distribution company, Meyer Distributing, based in Jasper, Indiana, that employs more than 850 people across the country and his net worth is somewhere between $37 million and $95 million. While Braun isn’t a lifelong politician he’s not a total outsider, either. He served as a representative in the Indiana statehouse from 2014 until late 2017, when he resigned from the seat to focus on his U.S. Senate campaign. THE FACTS: Braun did vote for a GOP-backed package of tax and fee hikes in 2017. The package included a 10-cent hike per gallon in Indiana’s fuel tax. Braun’s opponents have leveled this claim before, and the AP found the claim misleading in a Fact Check during a Republican primary debate in February . An economist said the claim is misleading because it doesn’t take into account inflation. “The most recent (tax increase) is always the largest because of inflation,” Purdue University economist Larry DeBoer told the AP at the time. The state’s largest tax increase in history, when inflation is included, was likely approved in 1983 when sales, income and corporate taxes were increased to boost revenue during the recession, DeBoer said. AP writer Brian Slodysko in Indianapolis contributed to this report.